I in no way, shape, or form consider myself an expert of chocolate. Up until a few years back, I wouldn’t even eat dark chocolate and had no desire to even try it. I can say that since then, I have been more open to trying a bigger variety of chocolate and have, for the most part, been pleasantly surprised. 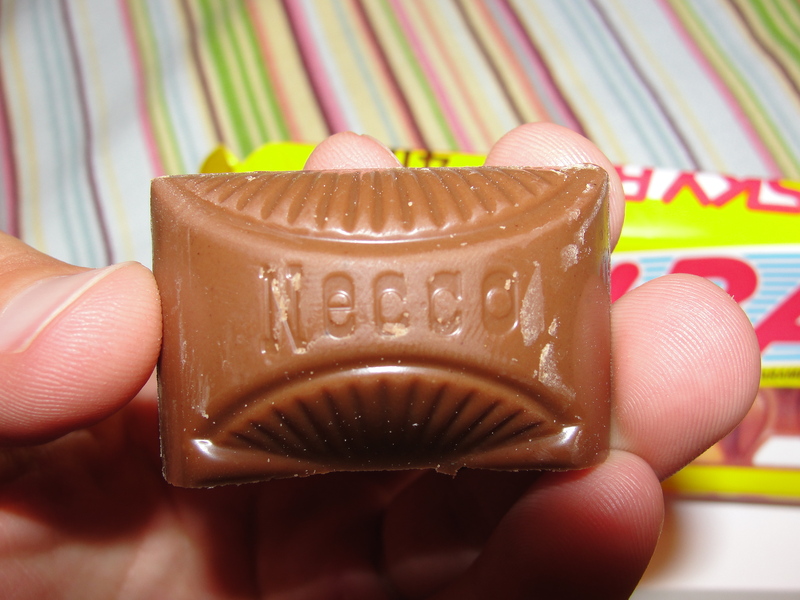 With that said, I feel as if I can say with certainty that the chocolate used in the Necco Skybar is Cheap, Gross and something I will never eat again. 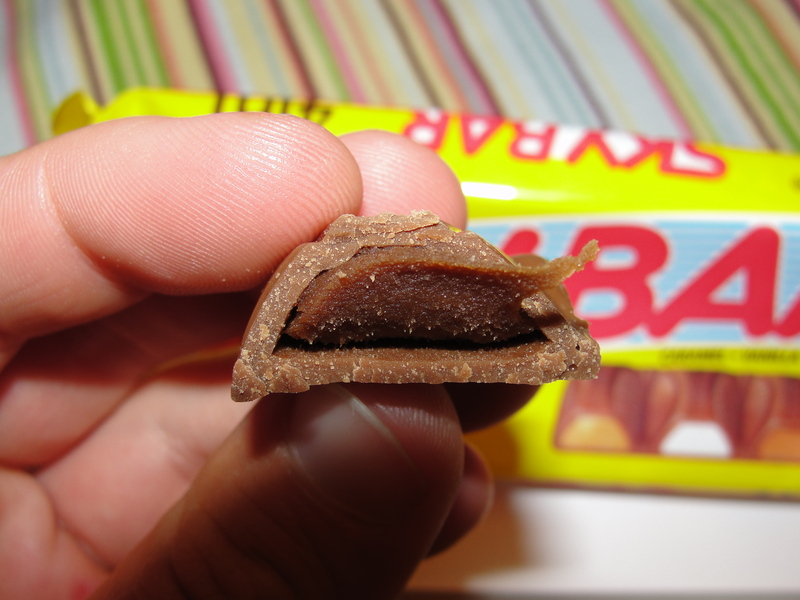 The Skybar is an oldie of a chocolate bar and in no way one that you find everywhere. After trying this bar, I can understand why this is. Mommy got this for me from a stop at Cracker Barrel so that I could review it for Grandma’s Backyard. I am glad that I got to try it so that I can explain to you all just how gross it really is and how you should never purchase one. The Skybar has four individual pieces all put together to form one bar. Each piece contains a different filling. Fudge, Peanut, Caramel and Vanilla are the four fillings. When I opened up this bar, I thought the size of it was right on par. Each individual piece appeared to be a bit larger than a nugget piece of Hersey’s candy. I decided to break apart each and every piece and break them apart to try them. I should have known this was going to be some bad chocolate when I saw that the color of it was so pale, it was tan. Ohh my. I started with the Fudge. When I broke the piece in half, I was able to see the contents of it. It appeared to be a thick chocolate coating. I placed the half piece in my mouth and began to eat it. Well, the first thing that hit me was how horrible the chocolate was. The taste of it was so sugary and manufactured – I wonder if they even used any real cocoa. Oh my gosh…it is hard for me to explain to you just how bad this chocolate was. Not only was the taste so wrong but, the consistency of it was not creamy at all. As I continued to chew the chocolate piece, the taste did not get any better. What also surprised me was how much the filling did not even taste like fudge. It was fudge colored but, it had relatively no taste whatsoever. The consistency of the fudge filling was really not noticeable to me at all. I finished the half piece of fudge Skybar and had no desire to eat the other half. Next up was the caramel piece. 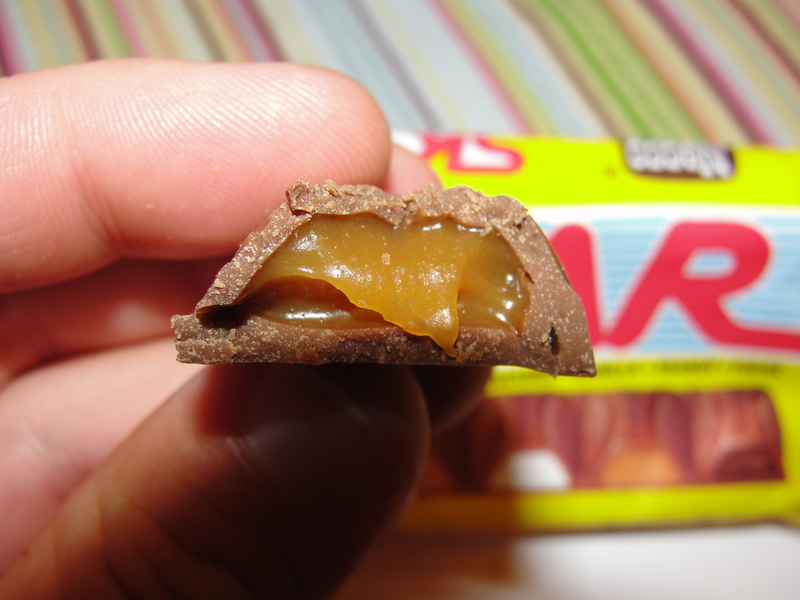 I can say that the caramel piece was the best of the 4. 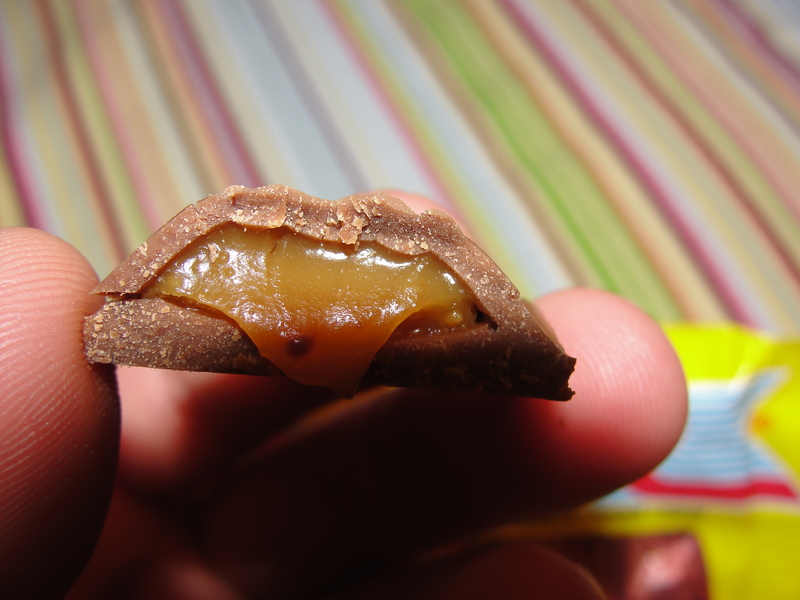 While the chocolate was still absolutely pseudo and disgusting, the caramel actually tasted like caramel. The familiar saltiness and creaminess was present and provided a nice contrast in flavor with the fake chocolate. The vanilla piece came next – totally gross. If I didn’t know that the filling was supposed to be vanilla, I would have never been able to guess that. There was certainly no Madagascar Vanilla Beans used in this sucker. I saved the Peanut piece for last because Peanut Butter is of course my favorite. Well, not the peanut butter used in the Skybar. This was about the same quality as the chocolate – fake, gross, nasty, blah. It was so bad that I had to force myself to finish it. By the time I had begun the Peanut Butter, I had gone through 3 very bad half pieces of chocolate and my mouth was so over the gross flavors. After a cup of milk, my mouth felt refreshed from the fake chocolate but the taste of it still remained on my brain. It is pretty easy to see why the Necco Skybar is no longer a popular candy and only sold in limited locations. 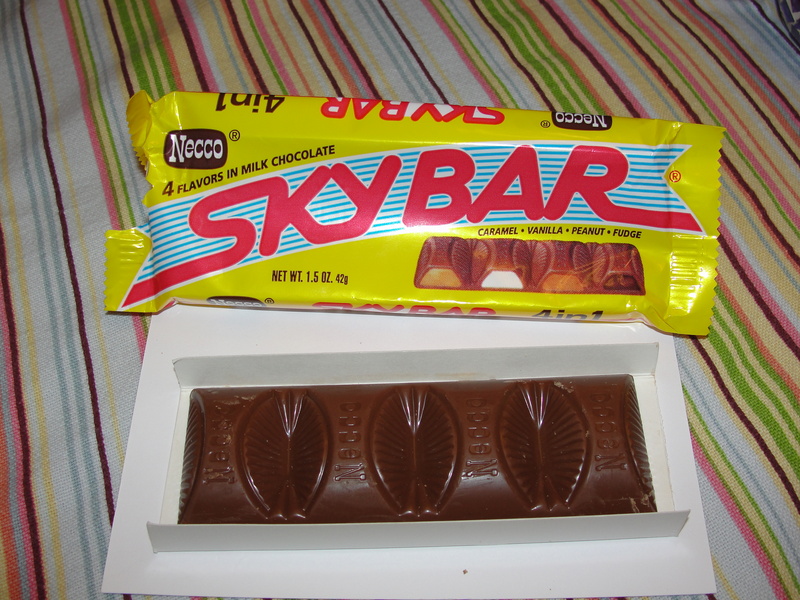 With all of the chocolate bars out there, offering much better chocolate & fillings, I see no reason at all why anyone would ever wish to eat a Skybar. 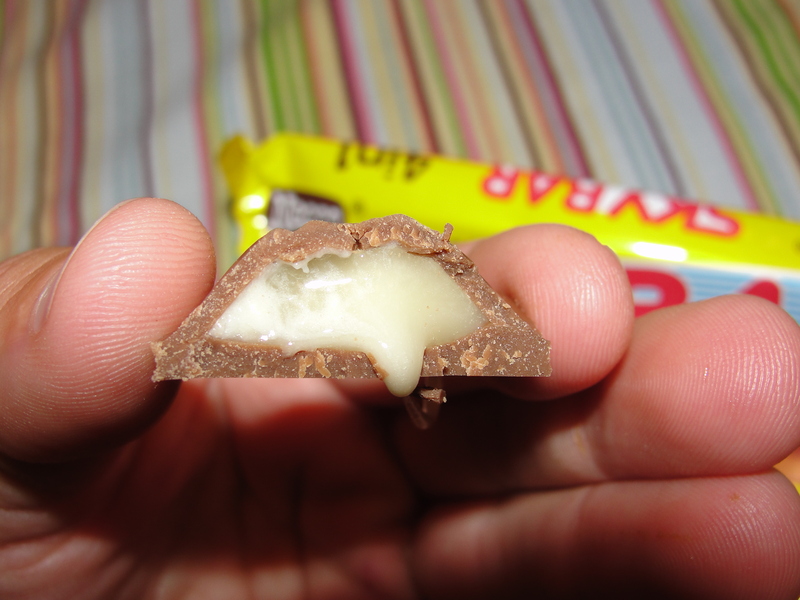 Hands down, this was the worst chocolate I have ever had…ever. The combination of sub-par ingredients, artificial flavorings and odd fillings make this Skybar a no-go for me. Do yourself a favor and make it a no-go for yourself as well. Skybars!! I remeber them from my childhood, and to think I actually loved them when I was a kid! But then again I think I loved all candy. BTW, your blog is amusing. I love the sleuthing vibe you create. I am so glad to hear that you enjoy the Blog!!!! !